Toyo University was founded by philosopher Enryo Inoue in 1887 as Shiritsu Tetsugakukan (private academy of philosophy) to provide education in diverse fields based on philosophy. It has grown into a well-established academic institution with five campuses in and around Tokyo, accommodating 46 departments in 13 faculties and 37 courses in 15 graduate schools. The university has more than 31,000 Japanese and international students from approximately 40 countries. While it encourages its students to study abroad, offering a series of generous scholarships that amounted to ¥148 million last year, it also accepts foreign students in three undergraduate courses and eight postgraduate courses that are conducted only or partially in English, as well as in all other courses using Japanese as the main language. In a bid to promote the internationalization of Japan’s education as a whole, the Ministry of Education, Culture, Sports, Science and Technology (MEXT) launched the Top Global University Project in 2014. Toyo University’s globalization initiative, Toyo Global Diamonds, was selected by MEXT to be supported within the framework of the Top Global University Project. “Diamonds” represents two ideas. 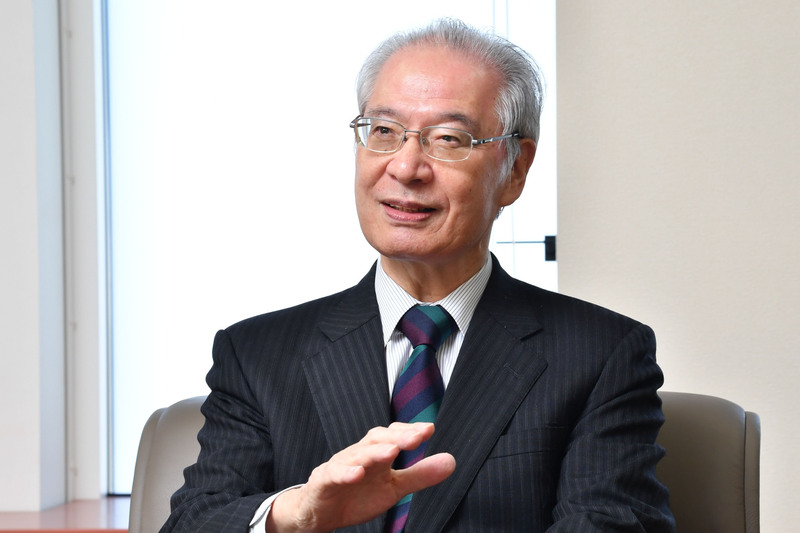 “We are aiming to foster an abundance of well-balanced human resources to form a kind of diamond-shaped diagram where the distribution centers around the middle levels,” said President Makio Takemura. The other idea behind “diamonds” is that every student is a diamond in the rough that can shine and flourish to survive through this century. These are the reasons why Toyo University does not invest in just a handful of super students, but all of its students, including those from abroad, fitting perfectly in line with founder Inoue’s policy to provide education to all, including those with limited time or money. “All students admitted into Toyo University automatically enter into the Toyo Global Leaders program,” explained Takemura. 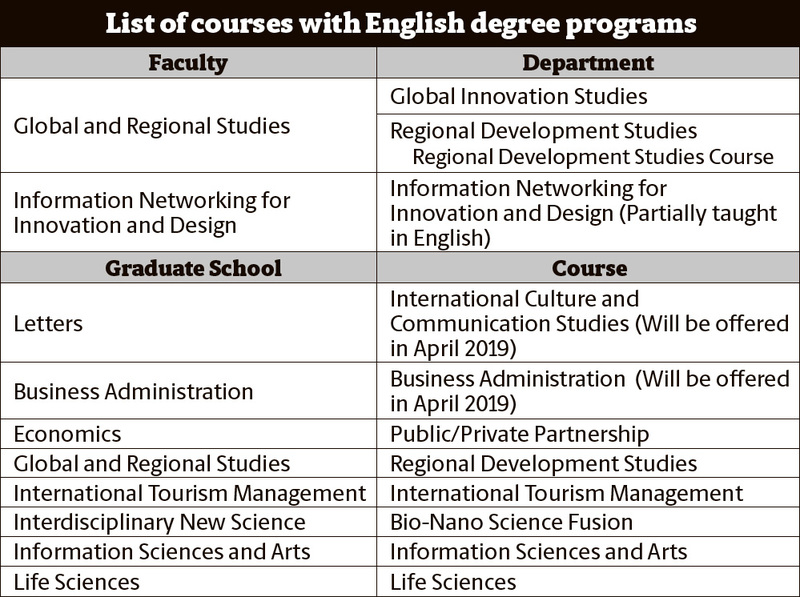 The program considers seven criteria, including the experience of overseas activities, subject credits earned in classes taught in foreign languages and writing theses in foreign languages. According to the levels of achievements, excellent students are given either gold, silver or bronze titles. It is a way to evaluate all students regardless of their departments and majors. “As part of the efforts to facilitate the mobility of students, particularly within the Asian region, Toyo University acts as the International Secretariat of the UMAP, University Mobility in Asia and the Pacific,” said Takemura. In addition, Toyo University’s job-hunting support program for foreign students has been selected as one of the 12 bases nationwide for the Career Development Program for Foreign Students in Japan by MEXT. The employment rate of foreign students graduating from Toyo University is 50 percent — a very high rate considering the fact that there is also a significant number of students who choose to pursue their postgraduate degrees. “We have won a prize at the Japan Ryugaku (study abroad) Awards for three consecutive years, and are committed to serving as a hub for young global leaders in Asia,” said Takemura. “Internationalization is not the same as becoming stateless. People who are able to perform well on the global level are the ones who have profound knowledge of their own countries and the ability to convey it to people of other cultures,” he said. “In the present day where modern rationalism seems to be coming to a deadlock, the principles of the East may be able to make a breakthrough,” said Takemura. The Faculty of Global and Regional Studies at Toyo University has two departments. These are the Department of Global Innovation Studies, where all classes are conducted in English, and the Department of Regional Development Studies. 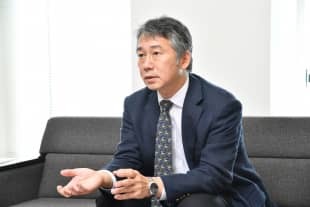 “The Department of Global Innovation Studies focuses on how to introduce various innovations to the social system of each locality effectively,” said faculty head professor Toshiya Aramaki. New technologies spring up daily, but the ways to make them useful in solving local issues vary depending on characteristics such as cultural, social, economic and financial situations, as well as a variety of other factors unique to each area. Introduction of innovation also involves people in various sectors such as media, education, human resources development, science and technology management and finance. 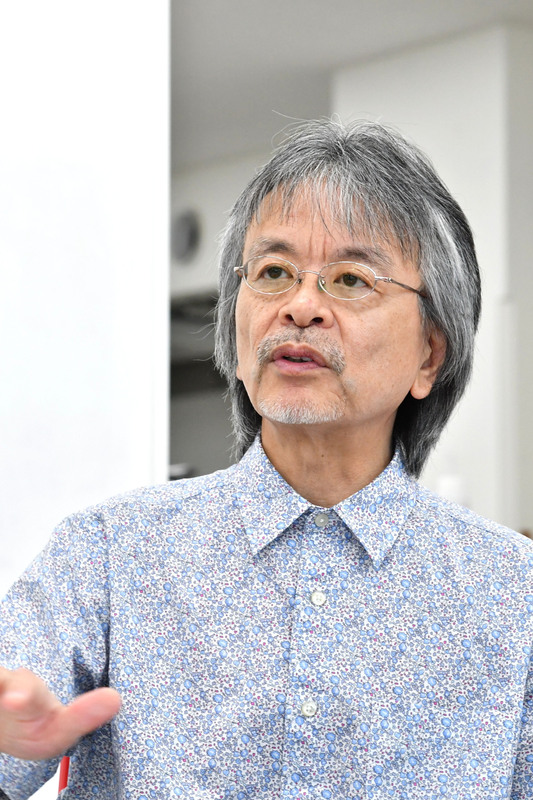 “So we have lecturers with diverse backgrounds — for example, former ministers, corporate analysts, auditors and people formerly with the media or think tanks,” Aramaki said. “Out of 100 students, 30 are international, while all 70 Japanese students have to study abroad for a year during their undergraduate years,” he said. Toyo University has 161 inter-university agreements and 87 interdepartmental agreements worldwide. Foreign students who wish to study at the Faculty of Global and Regional Studies can apply for the Top Global Scholarship (tuition waived and ¥150,000 a month). 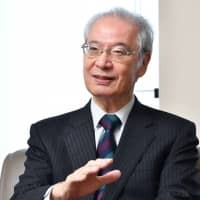 “The application process is mainly based on the examination of application documents and an additional online interview is needed, so students do not need to come to Japan just for an entrance exam,” said Aramaki. Even though all classes are conducted in English, Japanese language classes are mandatory for foreign students to help them acquire the language skills necessary to live and find a job in Japan if they wish. The Department of Regional Development Studies also accepts many students from abroad. About 60 students from 10 different countries attend courses with Japanese students. It is not an English-only department, but as many of the classes are held in English, it is possible for non-Japanese speaking students to enroll and graduate mainly using English. For Japanese students who enroll in this course, a five-week study abroad program is compulsory. It allows students to learn not only English, but also expose themselves to different cultures. As the department name suggests, students in this department learn how to find and solve regional issues to achieve development goals. “We offer many fieldwork-based classes to nurture practical and realistic perspectives in our students,” said Aramaki. A diverse teaching staff covers such areas as culture, anthropology, politics, urban planning, environment and disaster prevention. In addition to Japanese students, some international students also study abroad from Japan, using Toyo University as their hub. “We look forward to receiving many highly motivated students who can accept diversity and use their knowledge in engaging with societies proactively,” said Aramaki. The Bio-Nano Science Fusion course in the Graduate School of Interdisciplinary New Science is a postgraduate course conducted in English. The course takes place on Toyo’s Kawagoe Campus in Saitama Prefecture. The course accepts students and researchers from various fields such as applied chemistry, mechanical engineering, electrical and electronic engineering, biomedical engineering and even civil engineering and architecture to promote and facilitate research related to nanotechnology, biotechnology and bio-nano fusion technology. It was initially a doctoral course when it was first launched in 2007, but a master’s program was established in 2011 following the great success of the Ph.D. course. 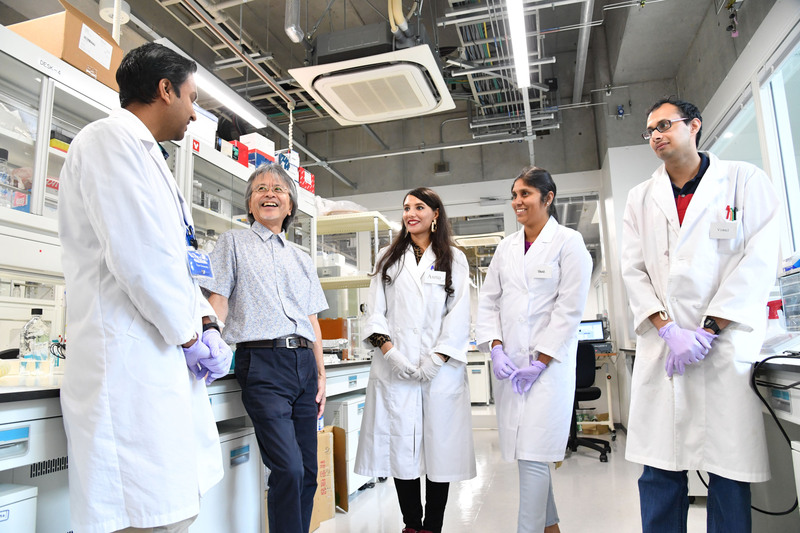 “We were very glad when we received more than 500 theses when we announced the new doctoral program in international journals,” said professor Toru Maekawa, the director of the Bio-Nano Electronics Research Centre, a research body that organizes the course that provides an excellent research environment with cutting-edge facilities and equipment. As of 2017, 29 students have earned a Ph.D. in the Bio-Nano Science Fusion course, 20 of whom were students from abroad. The center has accepted students and researchers from Oman, Malaysia, India, Algeria, Tunisia and many other countries, as well as some of the EU member states. “This year, we have 19 students, including six from abroad, in our course. We are also honored to have hosted the International Symposium on Nanoscience and Nanotechnology in May this year as part of the Marie Sklodowska-Curie ITN ‘Enabling Excellence’ Programme of the EU Horizon 2020,” said Maekawa. The symposium served as a great opportunity for students and researchers from European countries and Toyo University to build relationships for future collaborative research. While the Bio-Nano Electronics Research Centre hosts a number of international symposiums and conferences, the students and researchers who belong to the center also travel around the world to make presentations. Yuri Tanuma who skipped a year in her undergraduate program and is finishing her master’s degree this year, won a prize for the best poster presentation at a four-day international conference called NanoteC18 at the University of Sussex this summer. Started in 1998, it is one of the most respected series of international nanoscale carbon conferences in Europe. After finishing her master’s this year, she will attend the University of Nantes in France, one of 19 partner universities of the center to complete a double-degree program to earn a Ph.D. both in France and Japan. Associate professor Mohamed Sheikh Mohamed finished his doctoral degree in Toyo’s Bio-Nano Science Fusion course and became an associate professor to support successive generations of students. “This place offers a desirable research environment and ensures the freedom of thought. The center is totally supportive of the research of its students and researchers, and we have control over what we do,” he said.